Every woman has dreamed about her wedding day and what it means to her, that is why we are ready to listen to everyone’s hopes and ideas giving them the amazing opportunity to devise their own original wedding day. Our dedicated team of experienced British and English-speaking Greek professionals are passionate in using their local knowledge and love of the islands of Kefalonia and Ithaca to produce the most original bespoke wedding just for you. Arranging an overseas wedding may be a little daunting so we have compiled some example wedding plans to give you some suggestions and some example costings, then together we will advise, create and implement your plans as we take pride in guiding you through this wedding planning process, unobtrusively efficient, always approachable and entirely focused on making this exclusive tailor made service perfect, right down to the very last detail. The key to any successful wedding is forward planning utilising expert information and our qualified team can help with your choice of venues and suppliers to ensure your perfect celebration or event. 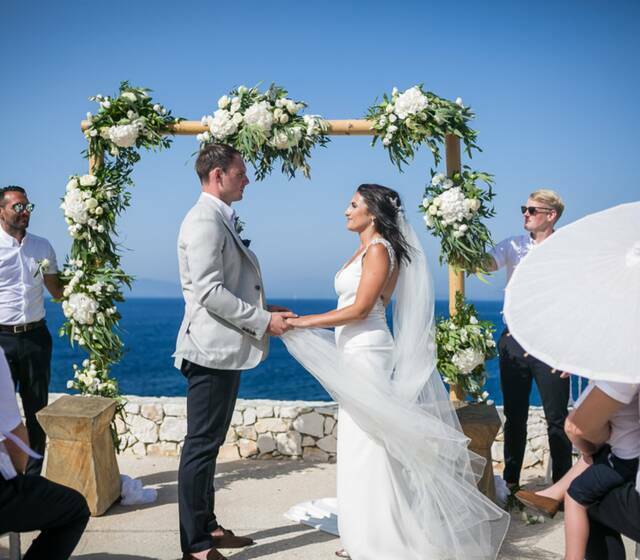 Kefalonia Weddings have negotiated exclusive offers so that you can walk down the aisle with confidence knowing that this will be the best wedding ever. After paying your initial deposit, you will receive your final invoice one month before your arrival. Kefalonia Weddings not only organises your big day, but also arranges hen and stag-dos, receptions, and will organise your accommodation too.